Apparently not everyone thinks it is a great idea to revert some Allston land to its agricultural past. What is the REAL Harvard plan? The stories from the Crimson and TAB give a pretty good sense of Monday's meeting (the 2nd one in 5 days). Members of the community are getting more clear and outspoken about their concerns and their expectation that our issues will be addressed. "the university had already incorporated many of the suggestions it has received, such as extending Rena Park all the way to the Charles River." It would be great if Harvard really was proposing to bring this park all the way to the river. Unfortunately, the reality is that Harvard's proposal doesn't go that far. Harvard's images on the left imply a connection to the river. But the devil is in the details, and the images on the right show that the details don't match up with what Harvard would like us to believe. The bicycle network in the upper-right shows a "major dual use path" in green that comes to a dead-end before reaching Soldiers Field Road. Below that, Harvard's river crossing diagram shows nothing where the image in the upper left shows a big swath of green connecting the campus and river. The problem has nothing to do with the fact that Harvard's images were "computer-drawn, rather than by hand", as suggested in the TAB. The real problem is that key information is missing and different parts of Harvard's proposal contradict other parts. We don't need swoopy, curvy arrows that obscure the reality of what Harvard wants to build. Harvard wants to wrap up this master plan in just a few months, so it is time for clear, unambiguous detail of what it wants to build here in Allston. Strong winds expected - Is Harvard ready? We know what happened near Harvard's $1B construction project last time it got a bit breezy. For tonight the National Weather Service has issued a wind advisory that predicts gusts as strong as 45 mph. What will Western Ave look like tomorrow? I've been meaning to take a walk along the eastern end of Western Ave to see the new fence that Harvard installed along its property across the street from the Business School. The fence was to be an improved screen between the sidewalk and the huge parking lot for shipping containers and trailers. A couple years ago the Harvard Allston Task Force's interim use subcommittee asked Harvard to replace the ugly fence there but was told that Harvard couldn't "step foot" on that property because of the CSX easement. That didn't make much sense. Why and how would a tenant prevent a landlord from improving their property if the improvement didn't adversely affect the tenant's use of the property? So after that reluctance it was encouraging to hear that somehow Harvard and CSX had figured out how to agree that the old fence could be replaced. As nice as it was for Harvard to put up the fence, it was even worse that their new fence didn't even last a month. Could it not withstand a 39 mph gust of wind on Sunday morning? This is at least as sorry as the collapse of the Pike's fence along Lincoln Street in 2005. Can the City protect us from even the most obvious threats to our safety? The owner had permits for demolition, but did not have a permit for asbestos removal, said Leon Bethune, the director of the environmental health office at the Boston Public Health Commission. Removing the asbestos shingles required permits from both the health commission and the Department of Environmental Protection, Bethune said. After inspecting the shingles, the health commission determined that they were in fact asbestos and should have been removed prior to demolition. “Basically, [the owner] violated a whole bunch of laws by doing this,” Bethune said. So on Monday when I walked past the demolition on at 205 Everett St (at the intersection with Holton St and across the street from the German school), I was disturbed to see the large cloud of dust drifting over the nearby homes. The demolition team didn't even have someone with a garden hose spraying water on the debris to keep the dust down. Nothing at all. My disappointment at the lack of neighborly consideration became outrage today when I passed the sight and saw an asbestos abatement crew and signs warning about "cancer and lung disease hazard". What is going on? Can the City's health commission and Inspectional Services Departments be trusted? Can they keep us safe? Its no secret that there is going to be a LOT of development in our neighborhood in the upcoming years. It is going to be a BIG problem if these two incidents are any indication of the City's inability to oversee construction-related activities. This Crimson and TAB stories excerpted below give a good overview of last night's meeting. You can download the presentation given by Harvard's consultants here. Residents and members of the Harvard Allston Campus Task Force expressed skepticism as to how open the campus would truly be. “The problem is getting in, not looking in,” said CTF member Michael Hanlon. One of the most contentious issues of the evening was whether Harvard’s plans were sufficient to revitalize Barry’s Corner. The plan included the construction of four buildings that would serve as cultural venues within two blocks of the corner, a move criticized by the task force as catering only to daytime visitors to the area. Others felt that Harvard’s proposed improvements didn’t meet Allston residents’ expectations for the project. “Try to figure out what we want there, in terms of vibrancy, and what would support that,” said CTF Chairman Ray Mellone. Support our community and have some fun on Saturday from 10-2 at the Hill Memorial Baptist Church annual fair. There will be a wide variety of homemade food, activities for the kids, knife sharpening (not for the kids), household goods, and more. The Hill Church is located at 279 N Harvard St. The sentiment of this editorial in today's Globe I think applies directly to Harvard's expansion. Is Boston a world-class city for everyone, or only for some people? The Globe is prompted to write because of the opening of the Mandarin Oriental in Boston, whose "tempting offers" include hotel rooms starting at $525. There is nothing wrong with another ultra-luxury hotel, but we also need development designed to improve life for the regular people. The Globe quotes the The Boston Foundation who says that the City and State face serious challenges that require "extraordinary collaborative efforts." Here in Allston, where Harvard's campus is expanding, residents daily see those challenges in areas like housing, transportation, and education. So far, we don't see much serious collaboration with Harvard or others to improve things in these areas. The editorial concludes with the aspiration for collaboration that "would be truly great if it could also produce a world-class city for everyone else". If Harvard develops hundreds of acres in Allston and its neighbors are just an afterthought, as it seemed from last night's presentation, a tremendous opportunity for collaboration will have been missed. So the BRA wants $1 million to build "an online social network to unite people worldwide who have Boston connections". I hope it is obvious that I'm a big fan of using the Internet and other technology in interesting and creative ways. But in these tight times, when Menino says we “must do more with less” it is far from clear that Boston should pump so much money into Boston World Partnerships, an organization whose president is the past director of the BRA. On a related note, today is the deadline to submit comments about the proposed development at 332 Chestnut Hill Ave. But when I went to the BRA's website to learn more about the project I found only a 2 sentence description, no mention that today is the comment deadline, and no link to the Project Notification Form. If the City/BRA has the time and money to get fancy with a social network, it should do some basic work on www.cityofboston.gov/bra ASAP so that it at least is performing its basic function of informing citizens about proposed development in our neighborhoods. It should be very interesting to see what Harvard will show when they unveil significant changes to their Master Plan on Wednesday at 6:30 at the Honan Library. Below are the comments I submitted after last week's Community Wide Planning meeting. An interesting way to think about our public realm planning is to imagine taking a walk through the neighborhood. This walk should be imagined at various times - during the workday, on weekends, evenings, and during the summer - and the walk should take us through the Holton St Corridor, North Harvard St from Western Ave to the river, and the entire length of Western Ave. Where will there be different types of activity and places of business? Where and when will it be quiet or more lively? This approach could also help us visualize the phasing of development. How will these walks feel in 2 years, 5 years, 10 years? Harvard already has thousands of students, faculty, and staff who work in Allston but we see none of them in Barry's Corner buying lunch or doing errands during lunch hour or after work. Instead, they stay on campus and use the post office, food court, bar/restaurant, and a Harvard Coop book store in basement of the Spangler Center. Harvard's Science Complex will be under a similar "bubble", with a private fitness center, private bar/restaurant, and other factors that will keep its workers inside instead of walking the streets of Allston and patronizing a variety of public businesses. Agreeing with Harvard to shift its new campus from its current model to a more public orientation is key to the success of the Allston economy and public realm. The Joseph Smith Health Center and Mahoney's Gardner Center deserve specific consideration in our planning for Western Ave.
Mahoney's is a successful locally owned business with a proven commitment to our community. It is also a place of exceptional natural beauty. Our planning should help provide Mahoney's with surroundings that will help it prosper. Mahoney's would like to stay in our neighborhood and build a larger facility. Where do you think this location should be? If Mahoney's expands in its current location (200 yards west of the Holton Street Corridor's western edge), should our planning for the Holton Street Corridor extend west to include the Mahoney's and the office building next door? If not, what should occur in this gap? The Health Center needs a larger facility to meet the needs of its current operations. Planning for its future could also consider the possibility of it becoming an outpatient medical facility for more A/B North residents. It could also be a place for Harvard's Allston community to receive health care. In any of these scenarios, the Health Center can be a valuable addition to a retail/commercial district because of its large number of patients and employees. Our planning should suggest at least one appropriate location on Western Ave for the Health Center. We need to figure out how to create meaningful retail improvements in less than the 5-7 years suggested. We also need a plan for what will happen in Barry's Corner, the Holton St Corridor, and other commercial areas of our neighborhood in the next 1-5 years. Housing is a crucial subject that unfortunately we did not have time to discuss on Wednesday, other than to hear the good news that there is sufficient market demand to justify new housing. I hope this topic will receive the time it deserves during our next meeting and will include development of specific, measurable goals in key areas like homeownership, affordability, and housing designed for families and senior citizens. The North Allston Strategic Framework made specific recommendations for the square footage of retail proposed in Barry's Corner and the Holton St Corridor. From the CWP preliminary concepts, it is unclear how much space is proposed for various uses, building heights, etc. Please provide this information and quantify estimates of how many businesses of various types might be expected (2 restaurants, 10 restaurants?). It was mentioned that the shape of Barry's Corner and the triangular island (home to the Exxon station) are problematic. Harvard Square overcomes similar oddities, but the reality in Allston may be that we should redesign Western Ave and North Harvard Street. This change could also have transportation benefits. The orange lines I've drawn below might be all wrong, but is there an option that you could provide for everyone's review? 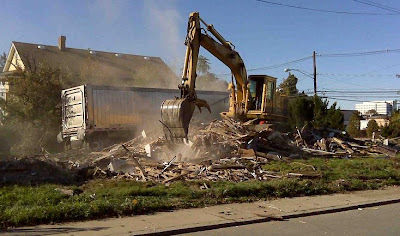 A few thoughts about today's demolition of the house at 205 Everett St that was the subject of blog posts in August 2008 and October 2007. The property was sold last week for $350,000. The City assessment for the property was much too low. The City thinks the land value is $159,000. According to the demolition permit it cost $10,000 to demolish it, so the City was off by $200,000. I've written in other locations about the City assessing land for much less than a developer will pay for it and I think it is time for our cash-strapped City to catch up with the reality of the market. This is a prominent location in our neighborhood. We should watch closely to see what the City and developer are interested in having built here and make sure we speak up loudly if the proposal is another 6 or 8 units of dorm-style apartments (like what has been built on Raymond and Adamson recently) that is contrary to our community goals for more ownership, more families, and more stability and diversity in our neighborhood. In 2004, the Globe wrote about people who live in Boston but, in violation of state law, register their cars in other states. They evade Boston's excise tax, state safety inspections, and state registration fees. According to the Globe story, in 1997 "the state's inspector general declared that cities and towns and the Commonwealth were losing millions each year to cheats who took advantage of lower insurance premiums by registering their cars out of state". City Councilor Rob Consalvo of Hyde Park seemed intent on doing something about this 4 years ago, but according to a letter from a Brighton resident that was the subject of this GlobeWatch column in today's Globe, the City and State are still unable to collect these millions of dollars that are literally sitting on our streets waiting to be collected. As the City and State are both about to make major budget cuts in response to declining revenues, it is time for our government to figure out how to collect this money that it is due. The Herald real estate section features the two new houses near the north end of Franklin Street that I wrote about last winter. Harvard announced yesterday the the largest donation in the history of its museums. Emily Pulitzer, the widow of the late newspaper mogul Joseph Pulitzer Jr., has donated $45 million for the renovation of the Fogg and 31 pieces of art worth $200 million. Pulitzer is a member of Harvard's President’s Advisory Committee on the Allston Initiative, and she commented to Harvard Magazine about Harvard's abortive attempt to build an arts building in Allston that would have been more a warehouse and office building and less a place for display and enjoyment of art. The modest gallery space in that building certainly would not have had the "large galleries for monumental contemporary works" now on the drawing board for Allston. “I think [having cancelled the Allston project is] really fortunate in a way, because what [ultimately] comes in Allston will be so much better”—in the wake of Harvard’s forthcoming revision of the Allston plans and the pending task-force report on the arts at Harvard in general. New art museum spaces, a new plan for the Peabody Museum, and new performing-arts facilities as yet unimagined are all part of the Allston possibilities she envisions. Hopefully others at Harvard share her ambition and what Harvard includes in its new master plan is worthy of her lofty goals. Its the Head Of The Charles weekend. That means all kinds of interesting activity along the river and also snarled traffic along the river, so think twice before getting in your car and heading from A/B North to Cambridge. "Menino predicted the city may be forced to postpone as much as $120 million worth of capital improvement projects, including maintenance and repairs of playgrounds, parks, sidewalks, streets, and schools." 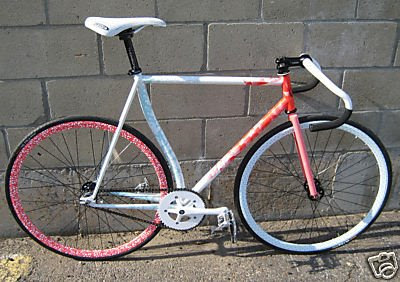 Allston's Geekhouse Bikes has created this excellent custom-built ObamaBike that is now for sale on Ebay. Proceeds will be donated to the Barack Obama victory fund and the winner of the auction will have one of the coolest bikes in town. You can register in person at City Hall or you can mail your registration form if it is postmarked tomorrow (the 15th). The Rock the Vote website has a simple web page that to create the form you can put in the mail. You must re-register to vote if you have moved to Boston, changed your name, or would like to change your party enrollment. If you move within the City of Boston, you must update your registration by notifying the Boston Election Department of your change of address in writing. Local Obama supporters are going from Allston Brighton to Manchester, NH on Sunday. Click to link to learn more. Harvard University: Request to install two wind turbines on top of the Soldiers Field Road garage for power. El Cafetal, 479 Cambridge St. Request for Beer & Wine license. Do Re Me Karaoke, Cambridge St. Request to extend hours of operation until 2:00A.M. Punjab Palace, Brighton Ave. Request to add Cordials to existing Beer & Wine license. The 1890's were a time of great growth in what is now known as North Allston and North Brighton. One of the many changes during this time was the creation of the 14 acre North Brighton Playstead, now known as Smith Field. These were the days before Soldiers Field Road, and this greenspace provided a direct connection from the growing Barry's Corner neighborhood to the river. Obviously a lot has changed in the last 100+ years, and as we are now doing planning that will shape our neighborhood for the next 100+ years, it is time to re-consider the location, design, and use of Smith Field. Often, Smith Field is empty or close to it. 14 acres is a lot of space, but Smith doesn't offer much to attract many users, as shown in Boston's Park Used Most Often data. Only 8 people selected Smith as the park they use most often, while 20 chose Ringer Park (10 acres) and 14 chose Rogers Park (8 acres). This is a small number of respondents, but I think the percentages would be similar in a larger survey. So while park size is necessary for some uses, a bigger park is not necessarily a better or more popular park, and after all, the point of having parks is for them to be used and enjoyed. How much do we use what Smith Field now has? Today Smith has 3 softball fields, 2 little league fields, 2 basketball courts, a small playground, open areas used for soccer, and a street hockey rink. Dogs and an occasional golfer are also seen at Smith. Do we need so many softball & little league fields? Could we use 14 acres differently to provide more recreational options for people who aren't interested in playing ball? 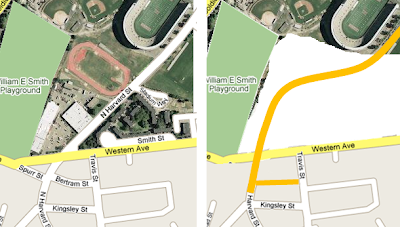 Should Smith Field be reconfigured generally in its current location? Urban planner Steve Cecil commented on Tuesday that the position of Smith Field limits the possibilities for the future of Barry's Corner. He explained that a 60 foot gap in active uses along a street discourages pedestrians from walking further. Smith Field's 400 foot long stone wall and often silent contents clearly qualifies as such a break in the continuity of pedestrian experience. One possibility would be to narrow Smith Field along Western Ave. The playground and basketball courts behind it could remain where they are. The little league field that is currently along Western Ave could move either onto the 9-acre WBZ property or the abutting property that is already owned by Harvard. This move would allow Barry's Corner to expand to the west and join with the existing (but empty) retail stores (former home of Charlesbank Cleaners) and down towards the new and much-improved Holton Street Corridor that was also discussed at Tuesday's meeting. Should Smith Field be divided into multiple, smaller parks? There are other locations in the neighborhood where decent sized parks could be created that would be more accessible to more people. At Tuesday's meeting we saw three designs that would create a lot of new parkland in the Holton Street Corridor and other parcels such as the old Verizon building at 224 Western Ave (next to the Dunkin Donuts) have been mentioned as possible park locations. There are also some small commercial/industrial buildings along Franklin St and elsewhere that could conceivably relocate to make room for small parks in the neighborhood. A balance of large and small parks is crucial. Tiny Winthrop Square in Cambridge (corner of JFK & Mt Auburn) was mentioned several times at Tuesday's meeting. It is a nice little park, but it is a very little park and it is not the only park in the area. The much larger Cambridge Common and JFK park are a short walk away and provide places for playing ball, running dogs, and other things you can't do in a 1/16th of an acre. Shattering Smith Field into a dozen tiny parks is not the right answer. But being bound by inertia and 110 year old land-use decisions is also not the way to make a great 21st century community. This week's A/B North Community Wide Planning meeting was the best one so far, though I still think that the meeting agendas are way too ambitious and that when so many important and multi-faceted issues are crammed into a single meeting there is too little time for the information to be digested, understood, and discussed. Tuesday's meeting earlier this week gave less than 2 hours to discuss Barry's Corner, the Holton Street Corridor, neighborhood-wide open space, and sustainability from a community viewpoint. Tuesday's meeting on the 14th will tackle housing, retail, and mutually beneficial development strategies. I'm all for getting things done, but I don't really like drinking from a fire hose. It's fun to watch Cookie Monster play Beat the Time, but that doesn't seem like the best way to plan a community's future. It is great that the BRA has posted the presentation from Tuesday's meeting on the CWP website. The file is in the PowerPoint 2007 format, so for those of you with an older version of PowerPoint (or none at all), you can use this free PowerPoint Viewer 2007 from Microsoft. w//36A, and an indoor café with smoking. Pretty bold for the Globe to ask NYC Mayor Bloomberg to challenge Menino. "...The $125 million gift, the largest in Harvard's history, comes from Hansjörg Wyss, a native of Switzerland who graduated from Harvard Business School in 1965. It will go to fund the Wyss Institute for Biologically Inspired Engineering over the next five years. The new institute will be part of the much-touted science complex in Allston, which will also house the Harvard Stem Cell Institute; the Stem Cell and Regenerative Biology Department, a joint venture between the Medical School and the Faculty of Arts and Sciences; and the Medical School’s Systems Biology Department." Back in April I wrote about Lesley University's vow to not repeat the mistakes that Harvard made dealing with Cambridge neighbors. Based on today's story in the Globe - Neighbors help Lesley design its new dorms - Lesley really is working together with its neighbors and reporter Peter Schworm is absolutely right that this is "a sharp contrast to the ongoing tussles over expansions at Boston College, Northeastern, and Harvard." The project's architect "said the final project is superior to the original" even though Lesley will probably lose money on the commercial shops that were added to the first floor of one building. I've met residents who are active in this part of Cambridge and they are no pushovers. How great (an unimaginable to some) would it be for Drew Faust or William Leahy to feel this way? Lesley president Joseph B. Moore praised the neighbors' dedication and said he agreed with their resolve to have the buildings blend with the neighborhood. "It wasn't negotiations, it was collaboration," he said. Sometimes I think that the relatively short news stories that summarize neighborhood meetings miss the essence of the meeting or only partial capture the feeling of the meeting. However, two recent stories by Andreae Downes in the Globe's City Weekly section hit both nails on their heads. The September 21 story, Designing new Harvard neighborhoods, concluded with what many people found to be a disturbing statement by Steve Cecil, whose firm The Cecil Group was hired by the BRA to lead the Community Wide Planning initiative. "Cecil said that the challenge planners faced at the Brighton Mills and the nearby Holton Street corridor was to find a development that would make enough money to warrant tearing down what is now there." First, the existing uses aren't so great that it should be a big hurdle to tear down the old, tired one-story commercial/industrial buildings around Western Ave and Holton Street. Second, and of greater concern, was the implication that Harvard's development would be predicated on its ability to make a profit. Harvard is a non-profit institution and there are many precedents for Harvard and other property owners to offer below-market rents or otherwise support desirable businesses or to improve local quality of life. For example, Thursday's Globe mentioned the sale of the Harvard Book Store and the "low lease costs" for the independent book store in Harvard Square that has Harvard University as its landlord. But residents quickly pointed out that Harvard's objectives in developing in Allston were not just about turning a profit on any particular block, but also about advancing the university's goals, which could include putting staff and faculty housing in nearby neighborhoods, keeping areas abutting its campus particularly livable and vibrant, and providing recreation and open space for students and faculty. "You can't visualize the Allston neighborhood in a traditional market way," said Bruce Houghton of the Harvard Task Force. "You have to assume that this area is owned by a rich institution that would like a healthy and vibrant neighborhood for the benefit of its mission." The story in today's paper - Stopping traffic before it starts expanded Harvard - also does a great job of capturing important parts of the September 24 meeting that I described last week. Some of the suggestions made by the Cecil Group and Harvard could be good ones, but "in the limited time allowed" for residents' questions and feedback, we could do little (if anything) more than hear people's quick initial reactions before jumping to another topic. Would adding at-grade pedestrian crossings to Soldiers Field Road "push traffic into the neighborhoods" as suggested by Paul Berkeley? Maybe, and because the meeting agenda overflowed with presentations spanning the spectrum of transportation issues, we had no opportunity for a thoughtful discussion on the subject. The possible changes of Soldiers Field Road, from the Western Ave/Watertown intersection to the Cambridge Street/River Street Bridge area, is not a trivial subject that can be resolved in a few minutes. What if we had an entire meeting on just this one subject? Andreae quotes a spokeswoman for the BRA named Jessica Shumaker who tells us that there will "absolutely" be additional time to discuss transportation in 2009. Why should we wait 3+ months to discuss such a crucial topic? As far as I know Jessica Shumaker has never been to a Harvard Allston meeting, and it would be a lot more reassuring if BRA Deputy Director Mike Glavin or Chief City Planner Kairos Shen were making these public statements. According to the Mayor, people in Allston were saying "Thank God you sent Kairos to help us", and it would be great to see Kairos doing more in public to help us instead of quietly sitting in a chair during these planning meetings or not showing up at all. The BRA has a Barry's Corner presentation scheduled for Tuesday's meeting. We've heard many wonderful-sounding promises and visions for Barry's Corner throughout the years - in some ways it has been the "carrot" dangled in front of the community that will make up for all the inconveniences and negative impacts of Harvard's expansion. The North Allston Strategic Framework described it as "providing common ground for both residential neighborhood and academic community", "a vibrant commercial center", and "a main street-like environment with approximately 200,000 square feet of community serving retail and services, with housing, academic, and other uses located on upper floors." Hopefully on Tuesday we will see some specific proposals for how this will become a reality in the near future. The Boston Civic Design Commission will discuss the Boston College Institutional Master Plan at their Tuesday, October 7 meeting in the BRA Board Room on the 9th floor of City Hall. The Boston Globe is looking for comments from people who would be affected by the proposed school closings. You can email James Vaznis at jvaznis@globe.com with your comments. Public meetings will be held at schools that would be affected by this plan. Dates and times have not been announced for these meetings. Which Boston Public Schools will close? Boston Public Schools Superintendent Carol Johnson will announce a plan this evening to close several schools. BPS has seen a 7% enrollment decline in the last 5 years and there are 8,000 empty seats in grades K-8. The Mary Lyon is likely to expand by adding a high school, so it is not closing. The Jackson/Mann - the largest school in A/B - and the Gardner - the 2nd largest & only one north of the Pike - would seem like unlikely candidates to close.